Early 80s fashion was very much different to the rest of the decade, and for this post I will show you some of the many styles being adopted by the popular pop stars of the day during 1981. As you will see, the hat played a major role in creating a number of iconic eighties looks. Anemic-looking Synth king Gary Numan decided to wear a trilby and a matching suit for the cover of his fifth studio album, Dance. In fact, Gary seemed to be going through a pretty sombre period, and I would challenge anyone to actually dance to the slow-tempo, minimalist tunes on offer on the album. Whether the title of the album was deliberately misleading is anyone's guess. The Trilby (and Pork Pie hat) were actually a popular choice with 2 Tone and Ska bands. While punk was blowing itself out, new dandy and flamboyant fashions were making their presence felt, with artists such as Visage's Steve Strange leading the way. It would appear that everyone was going crazy for hats, and the one being worn by Mr. Strange in the above photo was designed by milliner Stephen Jones. In complete contrast, here is the frontman of new wave band Classix Nouveaux with neither a hat or any hair, and he wouldn't look out of place in a 1950s horror movie. Here we see Princess Diana on October 1981 on walkabout in the rain in Carmarthen (this is Wales, what do you expect?) wearing a Caroline Charles tweed coat and a John Boyd hat. Here is Lady Diana Spencer (she became Princess of Wales after her marriage to Prince Charles on 29th July 1981) again wearing another splendid hat. This photo was taken a Nicholas Soames' wedding at Westiminster in London on 4th June 1981. At this time most people just referred to her as Lady Di, or Lady Diana. I remember certain tabloids often referred to her as "Shy Di". 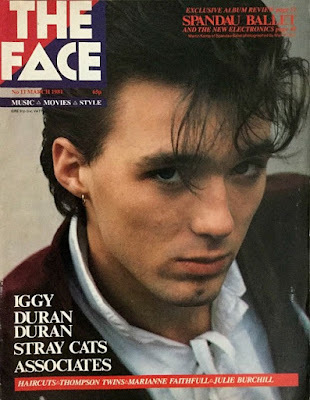 New Romanticism was gripping the nation in 1981, and here is one part of the fad, Duran Duran's bassist John Taylor. Indeed, we were entering a new era where men were starting to concern themselves more with their appearance. With hair styles become more severe and harder to control, men ditched their Brycreem and started spraying their hair with brands such as Cossack and Falcon. Both men and women were now wearing big hair styles, and hair spray sales soared after a decline during the 1970s. However, this left a huge hole in the ozone layer, with concerned scientists calling for the CFC's that caused it to be banned. 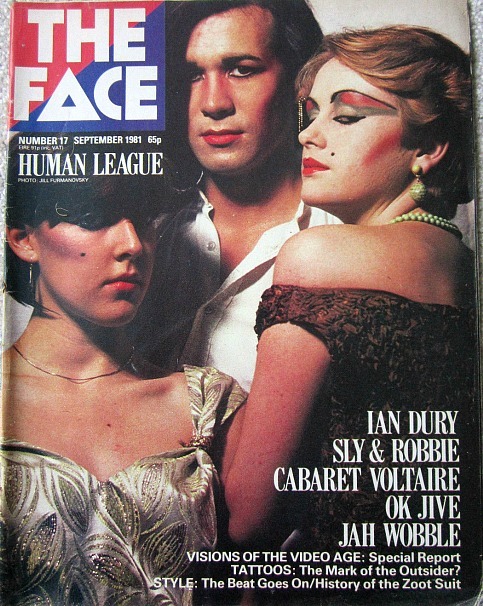 First published in May 1980, The Face magazine became synonymous with showcasing and influencing the fashion trends of the early 80s, particularly the New Romantic style. Here is a classic cover featuring the electronic new wave band Human League. Frontman Phil Oakey adopted a bizarre, lopsided hair style (his hair was long on his right side and worn over one eye) and some pretty eccentric clothing. Many would argue that the hair style was iconic, although there are plenty of people who believe it was simply ridiculous! 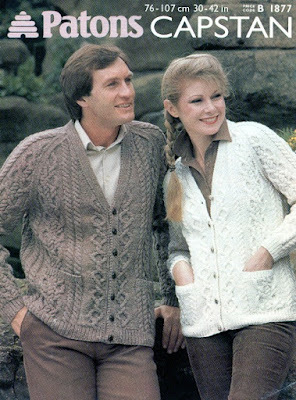 Of course, there were still many who preferred to stick with more conservative fashion styles, such as the aran cardigans featured in this knitting pattern by Patons. Here we see another early 80s fashion craze - 80s fitness. Sales of sweatbands, leggings and leg warmers soared as young ladies went crazy for dance and workout attire, with many even wearing their leg warmers over their jeans! This was just the start of it, and in 1982, Jane Fonda released her first video "Jane Fonda's Workout", which went on to sell around one million copies. The TV series Fame which started in 1982, helped to keep the fashion craze alive. Now, I would like to feature the fashion of Doctor Who in this post. Whilst searching for a suitable photo of Tom Baker, I came across this hilarious illustration of the five doctors William Hartnell, Patrick Troughton, Jon Pertwee, Tom Baker and Peter Davison, at least, I think that's meant to be Peter Davison, although I can't remember him wearing military gear. Indeed, as far as I can remember he mainly dressed as an Edwardian cricketer. Anyway, this has to one of the worst Doctor Who illustrations I've ever seen! Tom Baker looks like Luke Duke (from the Dukes of Hazzard) in a trance, and as for Jon Pertwee, he just looks positively weird! Tom Baker handed over the reigns to Davison in 1981, but his style was possibly the most iconic of all the original Doctors. He wore a long, multi-coloured scarf, a wide-brimmed hat (some of the time) and a long overcoat. The look was inspired by paintings of the singer and nightclub owner Aristide Bruant by French artist Henri de Toulouse-Leutrec, in which he wore a long red scarf, black cloak and also a wide-brimmed hat. This Doctor Who annual from 1983 shows Peter Davison in the very outfit I mentioned above. Blue Jeans Annual 1981 - and yet another hat! Striped nautical T-shirts with suits were regularly worn by Duran Duran, and were a particular favourite of frontman Simon Le Bon, who in this photo from a 1981 edition of Smash Hits can be seen also wearing a scarf around his head. Both John and Andy Taylor's hair is coloured and very new romantic. The band's lavish videos and sharp styles left them with no shortage of teen girl admirers. You will have noticed that I've used Smash Hits magazine covers in this post. While it may have been too mainstream to be considered hip, it was certainly the most popular teen pop magazine at the time, and many teenagers will have been inspired by the clothing worn by the major pop stars that graced its front covers, making it very much part of the 80s fashion scene. I hope I've provided you with a few good memories here, and you can see much more 80s fashion at my website simplyeighties.com.